Foxes are members of the dog family, and they live in different parts of the world. Some species can withstand varying climates and can live in the Arctic regions. All foxes reside in dens where they sleep and raise their cubs, so they are territorial by nature. Although foxes are adorable with their fur and bushy tail, they are not the best pets. Foxes are related to wolves, coyotes, jackals and dogs. The red fox (Vulpes vulpes) is the most common type, because it is hunted for its fur and as a sport in England. The color of the fox's fur depends upon where it lives and what type it is. Foxes have short legs and a skinny snout. Their ears stand tall and are triangular. They have thick fur and a long, full tail. The kit and swift foxes have pale gray or yellowish fur, and they usually live in deserts. The gray fox is larger than the red fox and lives in the forests. The arctic fox has rounded ears, and their fur changes from brown to gray in the summer and then to white in the winter. Some arctic foxes turn bluish gray in the winter instead of white. The fennec fox lives in the deserts and has a light cream-colored fur. 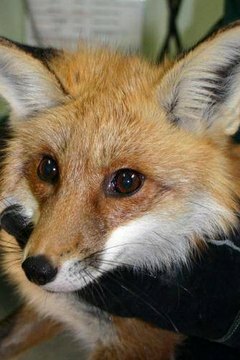 Foxes live in the United States, Eurasia and Africa. Their habitat consists of the forest and desert, but many of the species can adapt to harsher climates that don't have steady weather patterns. Because foxes are territorial, they occupy a space of 3 to 8 square kilometers. They seek shelter in dens, because this is where they end up raising their cubs. Foxes are usually solitary creatures, and they are hunters by nature. They eat birds' eggs, mice, rabbits, insects, fruit, moles and other small creatures. They defend their dens so other foxes don't invade their space. They can run up to 30 mph and are agile hunters. Foxes can be dangerous creatures, and because they are wild animals, they don't make the best pet. If you encounter a fox's den, you should stay away from it,. The fox may assume that you are a predator, especially if it has cubs.